CINCINNATI, Ohio — North Korea has released an American student who was sentenced to 15 years hard labor last year, and who has been in a coma ever since. Otto Warmbier, 22, was transported back to the United States on Tuesday and rushed to a hospital in Cincinnati. An unconfirmed report from North Korea states that Warmbier had contracted botulism following his trial, and was given a sleeping pill, but never woke up. 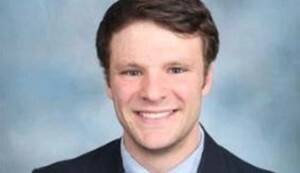 As previously reported, Warmbier, a University of Virginia undergraduate, was charged with subversion and sentenced in March 2016 by the North Korean Supreme Court, which considered the theft of the banner as part of an anti-regime plot in cooperation with the U.S. government. Warmbier had been taken into custody in January 2016 as he sought to board a flight back to America from the Pyongyang Sunan International Airport. It was found that while touring the country on a trip organized by the Chinese-based Young Pioneer Tours, he had stolen a poster from a North Korean hotel. Warmbier was brought out before reporters to read a confession, during which time he said that he took the banner for the mother of a friend who allegedly wanted the sign as a “trophy” to display at Friendship United Methodist Church in Wyoming, Ohio. Christian News Network contacted Friendship United Methodist Church, led by Meshach Kanyion, last March to obtain comment as to whether there was validity to the claims. Secretary Nancy Feverston, who took the call, laughed and said that Friendship United Methodist was not offering any comment. Warmbier tearfully pleaded for mercy as he read from the statement, which some suspiciously questioned as being scripted by North Korean officials. Regardless of what happened surrounding the poster, American officials state that it was wrong for the North Korean government to hold Warmbier. Secretary of State Rex Tillerson said that the State Department secured Warmbier’s release at the direction of President Trump. “Let me reiterate this: We strongly, strongly suggest that Americans do not go to North Korea,” Department spokesperson Heather Nauert also told the Washington Post.